While Bharatha was thus spending his days at Nandigrama in the constant contemplation of Rama, far away in the forest, on the Chitrakuta Peak, Sita, Rama and Lakshmana were praising his devotion and sense of dedication. They were happy in the peaceful, quiet forest home. One day, a fool named Jayantha sought to measure the valour of Rama, an adventure as foolish and suicidal as the attempt of an ant to discover the depth of the Ocean! 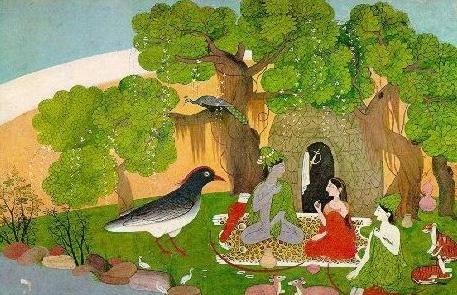 Prompted by sheer mischief, he transformed himself into a crow, and approaching Sita, who was seated by the side of Rama lost in the contemplation of the scenery spread out before them, and with his sharp beak, he pecked at the sole of her tender foot, causing blood to trickle from the wound. Seeing the stream of blood, Rama plucked a blade of dry grass from the ground and threw it at the crow. Rama will never hurt any one who has not done any injury. But, when it is necessary, and when it has to be done, even Rahu will swallow the Moon, isn't it? So too Rama. He will never hurt the innocent. But, that blade of grass became a huge flame of fire and flew towards Jayantha. And, when he fled, it pursued him relentlessly wherever he went. Helpless and frightened, the crow returned to its original form and Jayantha fell at the feet of Rama praying for succor. Indra came to know that the culprit was his own son and he too repented for his son's audacity and irreverence. Jayantha prostrated before Rama and pleaded for mercy. He said, "I am a fool. I did not realize the baseness of my deed. Save me from your anger, from this fire." Rama pitied the poor fellow, who had so humbled himself. He made one of his eyes ineffective and sent him away alive, as a single-eyed individual. The blade of grass that had become a missile of fire was neutralized by him and it resumed its nature. Jayantha was grateful that he was let off with just a token punishment for the heinous crime he had committed; he lived for a long time on the Chitrakuta Peak, where Sita, Rama and Lakshmana had taken residence. One day, the tenth day of the bright half of the month Margasira, Rama ordered Jayantha to proceed southwards from his habitat. Sita, Rama and Lakshmana too left Chitrakuta and reached the hermitage of the great Sage, Athri. The Sage came to know in advance of the intention of Rama to visit his retreat, through his pupils. So when Rama was approaching the Asram, he moved far out on the forest track in order to welcome Rama, Sita and Lakshmana. Athri was so overpowered with joy at the sign of Grace, that he shed profuse tears in his ecstasy and declared that the visit had indeed made his life realize its highest aim. He said that his austerities had at last borne fruit that day. That evening, the Sage Athri gathered his pupils and placed a high seat for Rama at the head of the assembly. His consort Anasuya had meanwhile attended to the needs of Sita and brought her too to that place. Then, he described to all present the sacredness of the occasion, the powers of Rama, Sita and Lakshmana, and the Divine Forces that had incarnated as those three. Anasuya also praised the virtues of Sita, and gave her holy counsel on the duties of women and the ideals they should ever hold dear. Sita spoke of the fact that every individual, every being, and every creature had the feminine principle inherent in its composition; she said that though there are masculine and feminine roles, acting on the world stage, all are basically feminine, when their strength, emotions and attitudes are considered. She said that her Lord, Rama, is the incarnation of the One and only Masculine principle in the Universe. In him, she said, there is no trace of duality, of mine and thine, of grief or joy. He is the embodiment of fearlessness; He is strength personified. Purusha or the Eternal Masculine has wedded Nature or Prakrithi, the Eternal Feminine. Though Nature appears manifold and variegated, it is really One undifferentiated Unity. Thus Sita revealed the truth of the Rama principle to Anasuya, the consort of the Sage Athri. Rama, Sita and Lakshmana spent a very happy time at the Asram of the Sage Athri. They gave good counsel to the residents and pupils on various problems of right conduct. Then, taking leave of the Sage, they resumed their journey through the jungle. The Asramites shed tears of sorrow when they parted company. Despite their determined attempts to accompany Rama during the subsequent stages of his forest life they had to stop away and resume the life for which they had dedicated their lives. They had to witness helplessly the departure of the Divine Master of their hearts. The jungle echoed with the roar of ferocious beasts that wandered about in search of prey. Manifold varieties of plumaged birds sang melodiously on the trees. Each had a peculiar beauty and melody: their coos and cries were balm for the ear. It appeared as if they had entered a new world of thrills. While passing through this region of awesome grandeur, suddenly their eyes fell upon a lovely hermitage, which had at its center a picturesque temple. Lakshmana moved forward, and cleared the track, pushing back the bushes that stood across. He broke off the thorny creepers that hung overhead and threatened to harm wayfarers. Rama and Sita could walk safely along the track he cleared. When they came to the precincts of the hermitage a charming garden presented itself before them. Well-fostered and affectionately looked after, the fruit trees and flowering trees rose beautifully from the ground, with their charming crowns of beauty. The branches were drooping under the weight of ripe juicy fruits. Sita was filled with delight; she forgot all exhaustion; she was lost in the heavenly peace and joy that she had come into. She walked behind Rama, imbibing the thrill of the Nature that surrounded her. When some residents noticed their approach, they ran in haste to their Preceptor; he hurried forward to the main gate to welcome Rama, Sita and Lakshmana. His eyes were streaming tears of joy. Appropriate hospitality was offered to the guests; they were taken in and given cool refreshing drinks; tasty fruits and tubers were placed before them. The guests accepted their attention and regard with great pleasure; they partook of the simple repast. In the evening, they took bath and performed due rites. Rama spoke to the residents on ideal modes of conduct and behaviour. He permitted them to ask questions on the doubts that might be puzzling them and the knotty points of interpretations of the scriptures. They welcomed the opportunity most enthusiastically. 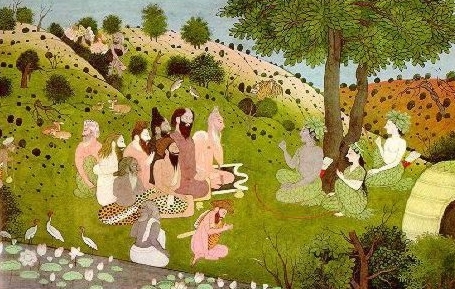 Rama, too, offered convincing and clear explanations, in simple and satisfying words. Without doubt, the dwellers of the Asram experienced very Heaven on earth. They spoke among themselves with great delight that the Presence of Rama was as elevating an experience as contact with God Himself in Heaven. When dawn broke, Rama, Sita and Lakshmana bathed and went through the matinal rites. In spite of the plaintive prayers of the Asramites, they started on their journey, expostulating that people should not stand in the way of their vows and resolutions. They had resolved, they said, not to stay in one single hermitage or place for more than one single night. When they resumed their journey, and passed through the forest, a monstrous form, being the frightful ogre Viradha, appeared all of a sudden and rushed menacingly towards them. Sita was naturally frightened at the apparition; but, soon, she mustered courage knowing that, when she had the Lion Rama to protect her, she had no need to be frightened at the 'lame fox' that had presented itself! "Let it roar its worst", she consoled herself. She stood behind Rama and watched developments. Meanwhile, Lakshmana shot at the monster a sharp arrow from his bow. Soon, he showered many missiles on it. When it was wounded by the arrows, Viradha transformed into a blazing fury of anger and appearing like the very embodiment of death and destruction, pounced upon Lakshmana. Rama saw that his brother was getting exhausted by the struggle; he fixed a crescent headed arrow to his redoubtable bow and shot at the ogre. The arrow shattered to pieces the formidable three-pronged spear that the ogre was flourishing; it then sliced off the head of the monster. At that very moment, a bright heavenly form emerged from the fallen corpse! Viradha had been born as an ogre on earth in consequence of a curse that he had invited upon himself from his divine Master, Kubera. He was one of a group of heavenly angels, Gandharvas, who were serving Kubera. Kubera had, later, taken pity on him and declared that his demonic career would come to an end the moment he met his death through an arrow from the bow of Rama. He could then return as a Gandharva to the Presence of Kubera, it was said. So, the Gandharva fell at the feet of his Saviour, and extolled him with high praise, before leaving for his permanent abode. Rama interred the huge body of the demon that lay on the ground; he also went through the rites prescribed for such disposal. Just then a shower of rain fell on the spot, as if the gods above were showering tears of joy at the compassion that Rama was evincing. Next, Rama entered the famous hermitage of the sage Sarabhanga. Even while he was nearing the asram, the ascetics and monks were talking among themselves of the havoc caused by the inroads of Ravana, the demon King. When Rama, Sita and Lakshmana appeared before them in the midst of their conversation, they sensed the meaning of their visit and knew that their fears would soon come to an end. When the sage Sarabhanga saw the divinely charming figure of Rama, he could scarce believe his eyes; he doubted whether it was a dream, or an illusion, or some strange experience caused by meditation mania. But, soon, he realized the genuineness of his good fortune; he was overwhelmed with the ecstasy of winning his long-desired goal; he knew that his asceticism had at last been blessed by the fruition of his yearning; he offered them profuse hospitality. 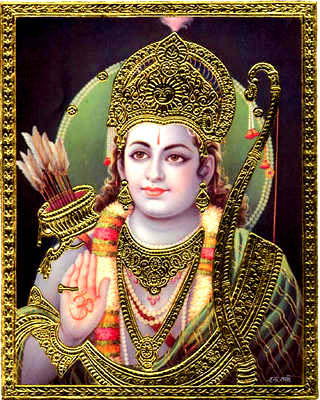 He extolled Rama to his heart's content. "Rama! You are the Heavenly Swan moving majestically on the waters that fill the minds of the sages. Ah! This day. I have realized the Goal of life," he said. "Rama! I am unaware of any spiritual discipline worth the name. It was possible for me to win you through just one path, the path of Love. My eyes have seen you now; they need look on nothing else. And, you have given word that day that you would fulfill the wishes of the sages. Well. Now you have to stand by that word. My wish is this: Stand before me in this most charming form, until my breath leaves this body. I wish to cast off this body even while my gaze is fixed on you," he appealed. Within minutes, a pyre was set up; he ascended it and it was lit, with Sarabhanga sitting unconcerned on top, with eyes shining in joy at the ecstasy of looking on at Rama. The eyelids did not quiver: the gaze did not slacken. With the forms of Rama, Sita and Lakshmana imprinted on his heart, Sarabhanga reduced his body into a handful of ashes. The blue placid waters of his heart reflected the blue form of Rama, whom he had adored until the very last. His soul merged in the Universal that was before him. Though at first the asramites were grieving over the departure of their Preceptor and Master, they soon realized that he had the unique fortune of a rare blessing. God Himself had come in human form and blessed him with mergence in His majesty and glory. They felt that they too had shared in that gift of Grace; they adored Rama and extolled him in various ways. They shouted 'Hail! Victory! Victory!' and taking the ashes of their Master, they applied it on their brows in reverent gratitude. The news of the immolation of Sarabhanga soon brought to that hermitage residents from other asrams as well. They fell at the feet of Rama and praised him and his mission of compassion. "Lord! How fortunate was Sarabhanga," they cried. "Many a sage has fallen prey to the voracious ferocity of the Rakshasa tribe of demons in this area. But Sarabhanga was blessed by the Lord Himself. He offered his body and life to the Lord Himself. "Lord! Save us from these rapacious enemies. Let us progress in our spiritual exercises and disciplines, without these demonic raids. And, at the end of it all, O Lord, bless us with the fruit we strive for: Your Presence before our Vision," they pleaded. Meanwhile, a sage, Sutheekshna by name, came forward and prostrated before Rama. He was the pupil of the renowned Agastya. He was an incomparable devotee and his mind was saturated with love for Rama. He had steady faith that God can be won by Love alone. He could not picture before his mind's eye any form of God other than Rama. He gazed upon Rama, without winking an eyelid, lest even that fraction of time should go waste. His heart melted into adoration at the sight of Rama. He said, "Lord! Did you come so far into this region just to bless me? Can you not merge me into the Love you are? Having come upon the earth with this visible form, do you still wish that I should adore, as hitherto, the Formless Absolute? No. I love this Form, and this Name. I do not know any rite or ritual. I know only that you, the embodiment of Love, can be attained through love. Yearning is the only earning I have accumulated. That is the only asceticism I have subjected myself to. Tell me, is that not enough? 0, Saviour from the travail of Birth and Death! No form of worship is so effective as service of the Lord through Love, isn't it? Singing your glory, meditating on it, and deriving unspeakable bliss in the process - can anything else yield greater joy?" he said. Sutheekshna danced about, unaware of where he was or what he was doing; tears flowed in streams down his cheeks; he appeared insane for all who could not gauge the inner joy he was experiencing. Rama knew the urge within the Sage; he drew him near himself, and embraced him most lovingly. He spoke soft and sweet, to bring him round to a consciousness of his surroundings. While Rama was holding his hands, the great sage entered the supreme state of Samadhi. He became a doll, unmoved and immovable. Rama brought him back into consciousness; as soon as he came to, he fell at the feet of Rama, falling flat on the ground. He raised his hands above his head and joining palms in adoration, he expressed his joy and took delight therein. He said, "Lord! You are the Conflagration that destroys the Forest of Delusion in which man has lost himself. 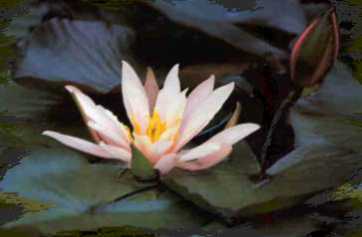 You are the Solar Orb that makes it possible for the Lotuses of the Hearts of Good Men bloom in beauty and fragrance. You are the King of Beasts, come to destroy the brood of Demonic Elephants. You are the Eagle come to hunt down and destroy the bird that flits into birth and flits out of life, in a recurring cycle of joy and grief. Lord! Your eyes are as charming as Lotuses; my two eyes cannot drink in all the beauty of your effulgent Form. You are the Moon that sheds cool light to enrapture the twin Chakora birds, namely, the eyes of Sita. You swim happily as the Celestial Swan in the placid lakes that shine in the hearts of Sages. You are the Garuda Bird that preys upon and destroys the Serpents that breed in the minds of doubters and unbelievers. All cruelty, confusion and calamity will be burnt away when a tiny glance from your eye falls on them." He extolled Rama thus and in various other forms, and derived great joy at getting the chance. He also utilized the chance to gaze upon the Lord and to have His Image imprinted on his heart. He was not conscious of the passage of time or the needs of the body. He did not wink once while looking on and drinking deep the glory of Rama. Rama watched him for a while and then he raised him up with his hands upon his shoulders. He said, "Sutheekshna! You are endowed with all desirable virtues. Ask from me anything you wish, for I shall bless you as you desire." The sage replied, "O, Friend and Kinsman of the Distressed! My wish is this: Reside ever in the depths of my heart, with Sita and Lakshmana." Rama said, "So be it." Then, with him as companion, Rama moved forward towards the asram of Agastya, with Sita and Lakshmana following him. A short distance later, they heard the murmur of a river flowing by. When they walked towards the sound and neared the river, they could see a mountain peak beside the flowing water. In the middle there were beautiful flower gardens; and, like a lotus shining in the center of a tank, there could be seen the lovely hermitage of Agastya on a carpet of fragrant flowers. Words cannot adequately describe the exquisite nature of that scene. Sita, Rama and Lakshmana stood petrified for a few moments at the captivating splendour. The atmosphere was so astoundingly spiritual. There, animals that are enemies of each other by their very nature, aquatic animals and land animals, beasts and birds of every type, sported and lived together, free from fear or enmity. They could see many monks and ascetics lost in meditation sitting on the river bank. When they neared the asram, Sutheekshna ran forward to convey the tidings to his Master. He fell at his feet and declared, "O Teacher Great! O Embodiment of Mercy! The prince of Ayodhya, the very Sustainer of this Universe, has just come into our Asram with Sita and Lakshmana. The very person whom you were seeking to know and visualize through your spiritual practices for years, without regard to whether it is day or night, he has come to you, near you. Ah! What a great good Day is this! What great good fortune!". Sutheekshna forgot himself and was filled with immeasurable ecstasy. At this, Agastya rose suddenly from his seat and walked fast into the open. He saw the three, coming towards him; tears flowed freely from his eyes. He ran forward, shouting, "Lord! Lord!". He clasped Rama to his bosom; he had no mind to release Rama from the embrace. He stood with his arms around Rama, clinging to him, as a creeper clings to the trunk of a tree. Agastya could not contain the joy that welled up within him when he led Rama, Sita and Lakshmana into his hermitage. He invited them to rest on elevated seats. He had fruits and sweet tubers brought and he offered them for their repast. Then, he enquired about the journey they had gone through and, when Rama was answering his queries, Agastya listened with eyes closed in deep delight, tears of joy streaming down the cheeks. There was a happy smile hovering on his face. At last, he spoke, "Lord! I am convinced that there is no one more blessed than I am. The Lord, Narayana, has Himself come to me; He is staying in my hermitage! Is this true? Is it a dream? No. It is clearly a fact of experience. He gave expression to his joy in grateful and devotional words. Rama said, "O Monarch among Monks! I have nothing to hide from you. You know too well the reason why I have come into the forest. Direct me, how I can destroy the brood of demoniac persons, the Rakshasas, who obstruct the austerities of sages and monks, and how I can protect and preserve from danger the dedicated servants of God; I shall act accordingly; I am awaiting your advice. In the cold Hemantha season lotuses shrivel up and die. The season has approached for the shriveling of the Rakshasas." Hearing these words of Rama, Agastya smiled. He replied, "Lord! You are omniscient. I do not know why you require me to tell you how. I am unable to decide whether you are blessing me or testing me. Nevertheless, through the effect of your Grace, the Darsan (sight), Sparsan (contact) and Sambhashan (speech) that you have just now blessed me with, I am able to grasp the significance of your question. That too is your grace. Maya which is your creation and your puppet, your slave, lying at your feet, is watching ever, for the slightest raising of your brow, to carry out your commands. Through the skill endowed by you, Maya is creating all beings on earth and in heaven. "Your Maya is unconquerable. It is harassing beings endlessly, that is to say, those who fall a prey to its machinations. That is a fact that is known to all. Your Maya is like the ficus, spreading far and wide; the orbs in the Cosmos are as the fruits of that tree; the beings and things that exist in this Cosmos are like the worms and larvae that creep inside the fruit. The fruit might appear lovely outside; but, when it is opened, hundreds of worms can be seen wriggling inside". "Those attached to this exterior world and its transitory treasures are afraid of you, since in your aspect as Time, you cause inexorable ruin of their plans. The Cosmos itself is an appearance on your Reality. Rama! You are adored by all the worlds. You ask me for directions, just as a common man would; you praise me as men do. This raises a laugh in me. I am not concerned with anything now. I desire that you stay in this hermitage, with Sita and Lakshmana. That is the only boon I ask for. I prefer always to worship your Attribute-full Form, not your Attribute-less Principle. That is what I believe in and teach. That is my Ideal, my favourite Goal, my Aspiration". "Therefore, grant me this boon. It is your sport, to elevate your servants, and yourself to slide into the background as if you are innocent of anything and ignorant of everything! But, do not elevate me. Do not ask me for directions. My duty is to assent and accept your wishes and to follow your footsteps. Father! Do not inveigle me into your Maya, and delude me into egoism, making me the target of your sport". At this Rama said, "O Venerable Sage! This region is well known to you; so, what harm is there if you tell me which place I can select for my stay? This is what everybody would expect of you, isn't it?" 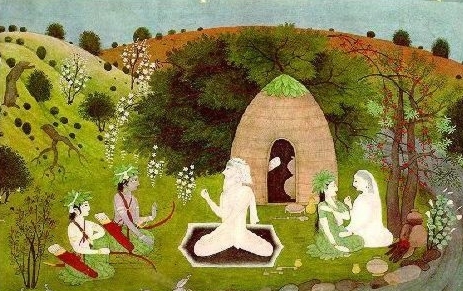 Agastya replied, "Master! Since you have commanded me I shall obey implicitly and give answer. Very near this place, the sacred river Godavari is flowing. Since ages, that great river has been flowing full and free. Adjacent to it, we have the Dandakaranya; when you sanctify it by residing in it you would have conferred upon the monks and sages that live therein all content and happiness. For, that forest region and its guardian ruler are under a curse and afflicted thereby". At this, Rama intercepted the sage with the words: "Master! Sita is anxious to learn the story of that curse. Tell us about it in detail". Agastya saw through that request and so he addressed Rama as "O, Director of this Eternal Play. Once upon a time famine raised its head in Panchavati area. All the monks and ascetics who lived there took refuge in the hermitage of Sage Gouthama. He gave them all they needed through the powers he had acquired as a result of his austerities! When the famine was over, the monks decided to return to their old dwellings". "But, there were some pseudomonks among them, who conspired against him, and planned to bring him to disrepute. They brought a cow that was in the throes of death and made it enter the hermitage garden, on a particularly green and attractive patch. Gouthama saw it was about to bite a beautiful flower away from its stem; he attempted to drive it away. But, at his very first push, the cow breathed its last! The conspirator monks immediately laid on him the dreaded sin of 'go-hathya' (bovicide)! They condemned him as an outcast and a heathen. Gouthama desired to discover whether the cow died as a result of his push or as its allotted span had ended. He sat in deep meditation exploring an answer to this vital question. Soon it was revealed to him that it was but a trick played by inimical monks. He was disgusted at their despicable nature. He said, 'May this forest polluted by such low-minded persons be out of bounds for the good and the saintly. May it become the haunt of demonic yakshas' ". "Another incident too added to the effects of this curse. The ruler of this region, Danda by name, violated the chastity of the daughter of his own preceptor, Bhrgu. Brghu listened to the pathetic story as related by his daughter and, in the extremity of his anger, he overwhelmed the region with a downpour of dust. Therefore, this area was sodden deep with mud, and in course of time, it was a thick jungle from end to end. The region is named Dandakaranya, after that infamous ruler. Rama! Crest-jewel of the Raghu Dynasty! I am certain that when you take residence in that forest, the Rakshasas will be decimated and the curse will be lifted. Monks and Sadhaks can once again dwell there and progress in their austerities. Humanity everywhere will benefit by this cleansing and this consummation. I may tell you that the sage who cursed will also be rendered happy by you, for he is sad at the consequence of his anger". When Agastya finished his account of the story of Dandakaranya, Rama said, "Well, so be it. I shall reside there". He took leave of the Sage Agastya, and proceeded to the Dandaka forest, with Sita and Lakshmana. Before they left his hermitage, Agastya brought forth certain weapons that he had acquired by asceticism from divine Sources, and placed them in the hands of Rama saying that he had no wish to use them; they had now a wielder who deserved them and who could utilize them for a holy purpose. "Rama!" he said, "You are my shield, my strength, my prowess. These weapons cannot save me, but You can. Your Grace is the most powerful weapon I possess. You are my refuge, my fortress, the impenetrable armour for my breast". Even as Sita, Rama and Lakshmana entered the thick jungle-ridden area of Dandaka, trees that had gone dry were thrilled into greenery and were covered with tender, whispering clusters of leaf. Weak, enervated creepers and vines suddenly felt alive, alert and active; they gave birth to bunches of fragrant flowers. The forest hastened to clothe itself in lovely green, speckled all over with multicoloured floral dots. They sought a spot where they could reside therein and soon arrived at the place known as Panchavati, which Agastya had indicated. They saw there the old Eagle Chief, Jatayu. He was a great friend of Dasaratha accompanying him on his spatial expeditions to help the denizens of heaven. Rama related to the Eagle the sad news of the death of Dasaratha and alleviated his sense of loss and bereavement. Rama told him about himself, and spoke to him about Sita and Lakshmana, and of his other brothers. They were set on rigging up a thatched hut on the banks of the Godavari. Jatayu became a close friend, and through him they could acquire a clearer picture of the region. That night, they spent the hours under a tree in sound and refreshing sleep.